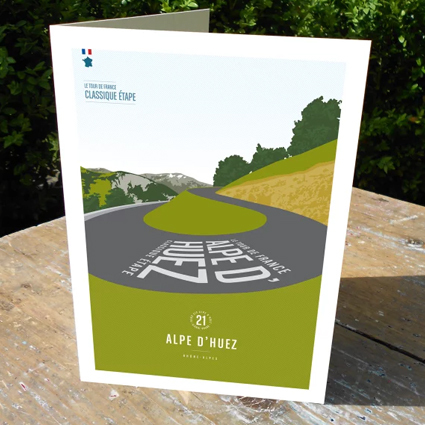 A retro style illustration of hairpin 6 of the iconic mountain of Alpe d Huez. Each of the stage winners have their names posted on one of the hairpin signs. Bend 6 is dedicated to the Italian Gianni Bugno. And no mountain classique étape would not be the same without the writing on the road! Printed onto a 324gsm Mohawk Eggshell White card. Card size is 126 x 178 mm blank inside, comes with a white envelope and packaged in a protective cello sleeve. Documenting and celebrating great moments in cycling.